Rubber Ducky, you're the one; you make bath time, lots of fun. Kids know this from Sesame Street. What better way to decorate the bath towel you wrap baby in. 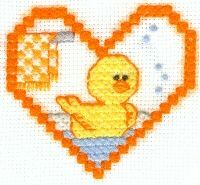 The bright yellow ducky framed in a vibrant orange heart can be embroidered on the hooded corner of baby's bath wrap. Carry the design through onto cross stitch bath mitts and wash cloths. Dot the background with small, bright yellow and orange hearts. When your toddler needs a larger towel, embroider this ducky on white or ivory 3-inch cross stitch bands (edges come finished) and sew them onto the towel of your choice. You don't have to stick to just one. Sprinkle these water-loving images throughout the little one's bathroom. You can find them all here. This rubber ducky chart was originally designed and used as another block or square for a baby afghan or baby quilt. Click here for a printable chart of Rubber Ducky with instructions, stitch count and floss numbers. A new window will open so you can continue browsing here. You can print all three pages of the file or just the pages you wish.